Five teams of fourth-year industrial and interaction design (IID) students in the College of Visual and Performing Arts’ Department of Design will compete on Friday, Dec. 13, in the program’s annual 360° IID Competition, which encourages comprehensive research, analysis and visionary problemsolving. This year’s competition focuses on the creation of innovative ideas for the built environment, which could include new material applications or new applications for old materials in the construction industry. 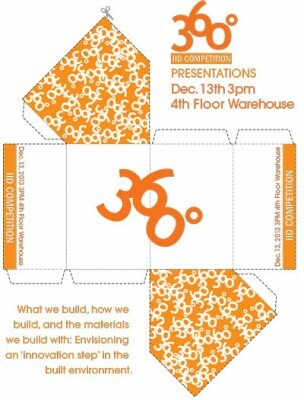 The students’ presentations will be held at 3 p.m. on the fourth floor of The Warehouse, 350 W. Fayette St., Syracuse. The event is free and open to the public. The winning team will receive the Philip H. Stevens Award, which is named in honor of the late Stevens ’51, who was an industrial designer and president of Philip Stevens Associates Ltd. in Skaneateles, N.Y. The student teams worked on their ideas for the competition throughout the fall semester and were assigned IID alumni as advisors. The teams were asked to envision an “innovation step”—the translation of any invention into a proposal for a commercial product or system. Judging the 360° IID Competition are Rich Beckman, industrial designer at e2e Materials, Inc.; Rob Englert, principal of ram; John Liddy G’03, entrepreneur-in-residence at Syracuse Technology Garden; Jane Mills, production manager at Salt Works; Scott Ryan, principal at Brownlie Design; Greg Smiley, manager of industrial design at the Raymond Corporation; Josh Stack, counselor at law and advisor in resilience science and biomimicry; and Kevin Stack, founder and CEO of Northeast Natural Homes, Inc. Team advisors include IID alumni Leigh Cohen ’10, IDEO; Bruce Leonard ’75, Rochester Institute of Technology; John Lonczak ’77, phi-d product/brand development; James Rudolph ’06, Farm Design Inc.; Damien Skop ’02, Summit Manufacturing; and Bert Straus ’59, Protective Sports Equipment, Inc.
For more information about the competition, contact Donald Carr, professor of IID, at dwcarr@syr.edu.